The Institute for Integrative Nutrition, the world’s largest nutrition school, has a mission: “To play a crucial role in improving health and happiness, and through that process, create a ripple effect that transforms the world.” Instructors include well-known wellness gurus like Joy Bauer (health expert for the TODAY Show) and Dr. Barry Sears (The Zone Diet), as well as financial advisors and renowned psychologists. 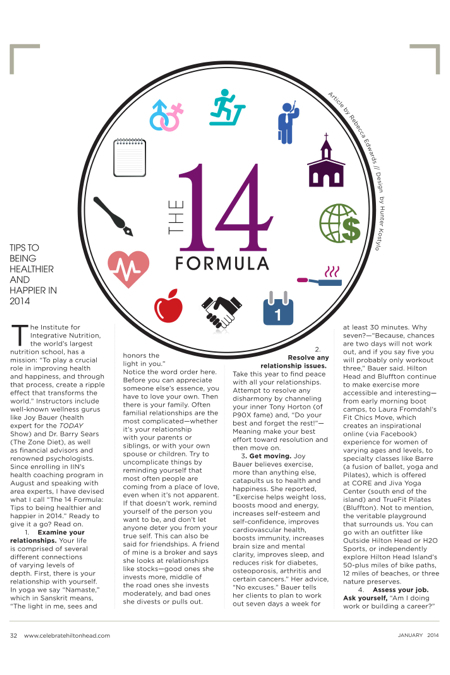 Since enrolling in IIN’s health coaching program in August and speaking with area experts, I have devised what I call “The 14 Formula: Tips to being healthier and happier in 2014.” Ready to give it a go? Read on. 1.Examine your relationships. Your life is comprised of several different connections of varying levels of depth. First, there is your relationship with yourself. In yoga we say “Namaste,” which in Sanskrit means, “The light in me, sees and honors the light in you.” Notice the word order here. Before you can appreciate someone else’s essence, you have to love your own. Then there is your family. Often familial relationships are the most complicated—whether it’s your relationship with your parents or siblings, or with your own spouse or children. Try to uncomplicate things by reminding yourself that most often people are coming from a place of love, even when it’s not apparent. If that doesn’t work, remind yourself of the person you want to be, and don’t let anyone deter you from your true self. This can also be said for friendships. A friend of mine is a broker and says she looks at relationships like stocks—good ones she invests more, middle of the road ones she invests moderately, and bad ones she divests or pulls out. 2.Resolve any relationship issues. Take this year to find peace with all your relationships. Attempt to resolve any disharmony by channeling your inner Tony Horton (of P90X fame) and, “Do your best and forget the rest!”—Meaning make your best effort toward resolution and then move on. 3. Get moving. Joy Bauer believes exercise, more than anything else, catapults us to health and happiness. She reported, “Exercise helps weight loss, boosts mood and energy, increases self-esteem and self-confidence, improves cardiovascular health, boosts immunity, increases brain size and mental clarity, improves sleep, and reduces risk for diabetes, osteoporosis, arthritis and certain cancers.” Her advice, “No excuses.” Bauer tells her clients to plan to work out seven days a week for at least 30 minutes. Why seven?—“Because, chances are two days will not work out, and if you say five you will probably only workout three,” Bauer said. Hilton Head and Bluffton continue to make exercise more accessible and interesting—from early morning boot camps, to Laura Fromdahl’s Fit Chics Move, which creates an inspirational online (via Facebook) experience for women of varying ages and levels, to specialty classes like Barre (a fusion of ballet, yoga and Pilates), which is offered at CORE and Jiva Yoga Center (south end of the island) and TrueFit Pilates (Bluffton). Not to mention, the veritable playground that surrounds us. You can go with an outfitter like Outside Hilton Head or H2O Sports, or independently explore Hilton Head Island’s 50-plus miles of bike paths, 12 miles of beaches, or three nature preserves. 4.Assess your job. Ask yourself, “Am I doing work or building a career?” According to the Bureau of Labor Statistics, the average American (ages 25-54) spends the majority of his/her day working (roughly 8.8). Let’s make this time count. Try this IIN exercise to create your ideal career path. Brainstorm these three areas: things you enjoy, things you are good at, and things that are good for the world. On a separate piece of paper, draw three overlapping circles. Then, fill in the circles with ideas in each area. In the inner overlapping circle, make note of a few items that cover all three areas—these are possible career goals you might consider. 6.Be a good financial planner. Check out these 10 “cash-mandments” from Manisha Thakor, founder of Women’s Financial Literacy Initiative. (1) Be part of the karmic flow of money. Know your worth and charge sufficient rates for your time. (2) Ask yourself, “When I live my life from a position of financial strength I will…?” This question forces you to look at what financial strength means to you and what you want to gain from your money—thus helping to budget. (3) Divide your budget then into 20 percent savings, 30 percent wants, and 50 percent needs. (4) Know, you can comfortably afford a home that has a total price of three times your total income. (5) Know, you can comfortably afford a car that is one third of your income. (6) Know, on average, children cost $10,000 each per year before education. (7) Note, ideally you should not take on more in student loan debts than you can make on average for your first 10 years out of school. Identify where you can make trade-offs. Can you do your own nails or only buy organic when it comes to the “dirty dozen foods”? (9) Keep track of what you spend. (10) Consult a financial planner or money-savvy friend to make sure you are seeing your big financial picture. 7.Expand your horizons. Okay, this one is in every self-help book so we will not spend too much time on it, but it really is true. Try new recipes or restaurants. See someplace new. Get a haircut, piercing, tattoo, or even a risqué new outfit. Time tends to box us in, so put on your fighting gloves and box time. 8.Practice good time management. Every Sunday use a planner or app on your computer, phone or smart device and input the times you will work, exercise, take time for yourself, grocery shop and other errands, help your kids with homework or other kid-related activities, socialize, cook, do chores, etc. The first few times you try this it will seem daunting. But the more you do it, the easier it gets. Plus, you will start to notice patterns and think of better ways to spend your time and multi-task. 9.Try random acts of kindness. The yoga term ahimsa means “non-harming,” and when I am really in a pissed off mood, I can always turn it around by practicing it. Next time you are having a terrible, horrible, no good, very bad day, try opening a door for a stranger. Note, the inverse of ahimsa, or practicing mean-spiritedness, really does wreak havoc on your body. Every time you honk at someone in traffic, not only are you creating negative karma, but you are also increasing your cortisol levels—a hormone which can lead to weight gain, poor sleep, and a host of health concerns. 10.Don’t diet. IIN emphasizes “bio-individuality,” or the theory that one person’s food is another person’s poison, and fitting out, or filling your plate with more healthy foods so there is less room for unhealthy foods. Basically, diets work for some and not for others and the old adage, “what you resist persists” applies here. What you do want to do is tip #11 (see below). 11.Reduce inflammation. According to Dr. Barry Sears, “Silent inflammation is the secret killer.” Inflammation causes chronic illness and pain, aging, mood swings, poor sleep, cancer, type 2 diabetes, allergies and obesity—just to name a few. What causes silent inflammation? Dr. Sears blames, “increased refined carbohydrate consumption, increased vegetable oil consumption and decreased omega-3 consumption.” Consider a 21-day elimination cleanse and refrain from gluten (wheat products), soy, dairy and sugar. Then slowly reintroduced these foods so you can identify what foods create a reaction and should be avoided. 12.Be Creative. Creative expression comes in several forms—from visual arts, to journaling or blogging, to what you wear. Check out places like See Salt Studio (Squire Pope Ave.) and Artist Uncorked (Ridgeland); write down your thoughts or organize your closest so you can better see your wardrobe. 13.Goal Set. Set aside 10 minutes. Get one piece of paper and write down three goals you have for next week, next month, the next six months, next year, next two years, next five years and next ten years. Fit everything on that single piece of paper that you then place somewhere visible like the refrigerator or a picture frame by your bed, or neatly fold and put in your wallet or purse. As often as possible, refer to that sheet and make a new one each year.